At fine art shows, you wouldn’t be surprised to see paintings, sculpture, or work on paper. These days, fine art even includes film, photography, conceptual art, and printmaking. At Spectrum Miami, a curated fine art show in the heart of Miami’s Arts & Entertainment District, you’ll find fine art furniture, too. Bruce Schuettinger, president and wooden artifacts conservator at Schuettinger Conservation Services and owner of MosArt Furniture in New Market, Maryland, has been transforming wood into fine art furniture for more than 35 years. 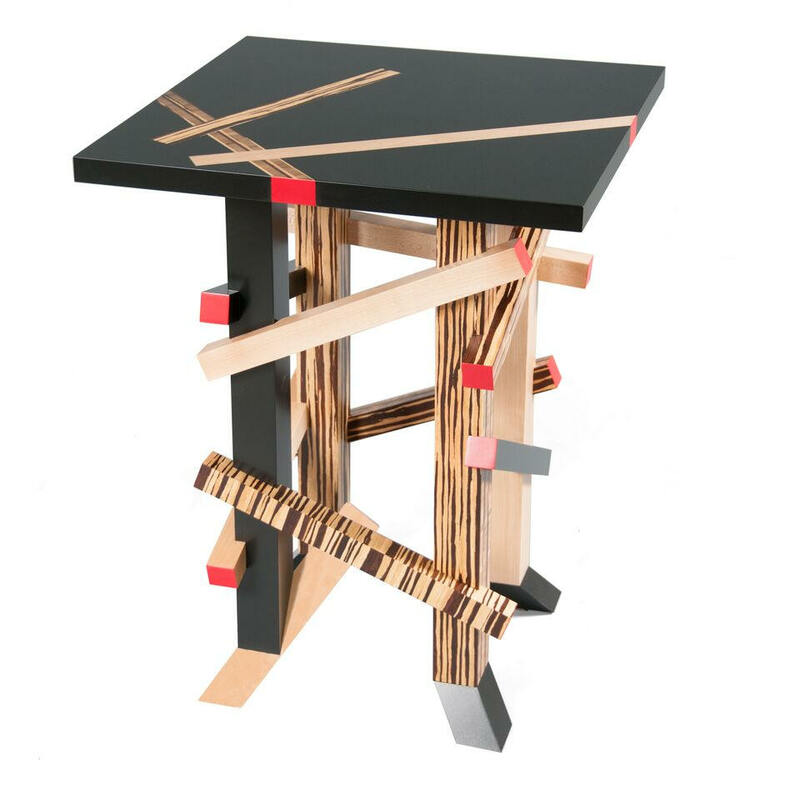 Just like an artist titles his work, Schuettinger titles, signs, and dates his pieces of fine art furniture, too. At Artexpo New York 2017, Schuettinger showcased, among other items, Pieces, a sideboard/credenza made from 44 different species and figured grain patterns, and Directions, an executive desk featuring three-dimensional sculptural elements based on the abstract expressionism and abstract illusionism art movements of the 20th century and three secret compartments with one accessed through a mechanical locking system activated by a sculptural paperweight. After a successful show at Artexpo New York, Schuettinger will be exhibiting his fine art furniture at Spectrum Miami Dec 6–10, 2017. 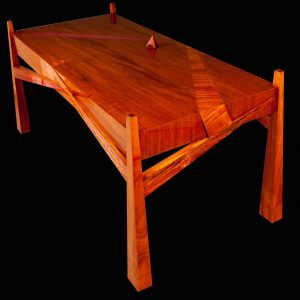 He sat down with Redwood Media Group to talk about his training in the collegiate studio fine art community, his philosophy when it comes to creating fine art furniture, and what he’s working on now. Was creating fine art furniture what you dreamed about doing when you were growing up? My mom was a great entertainer in the local society. Folks would come over and ask me what I wanted to be when I grew up. “The only thing I can tell you is that I’d like to be able to work with my hands,” I’d say. As time went on, I decided that if I was going to go to college, I was going to be a fine art major. That’s the avenue I pursued. I had three basic areas of studio work that I enjoyed. One happened to be woodworking. In woodworking, others were doing sculptures. I strictly wanted to be practical and make functional furniture. When I graduated from Towson State University with honors in fine art, I chickened out. A lot of people wanted to teach art or become an artist. I felt it was too much of a struggle, so I went down the line of becoming a conservator. Then I did consulting, authentication, valuation, and I became a trained personal property appraiser. All of this has put a tremendous amount of furniture in front of me. The earliest piece we ever treated was 1450. It’s given me the ability to create furniture now from an artistic perspective that most people wouldn’t have the opportunity to do. Because of my knowledge of history relating to furniture, I’m inspired to do some work that was done many years ago but bring it forward to today. What inspires you about the great craftsmen who have come before you? Even just that question sends chills up my spine. The work done by these great artisans is amazing. For us as conservators and consultants to have handled these fantastic pieces, it’s just awe-inspiring for us. I have a library of 850 books on furniture and related decorative arts. The amount of material that has been created and documented since the Egyptians is huge. We’re motivated as current craftsmen and artists to bring as much of that forward in our work as we can to a new generation. What’s your philosophy when it comes to creating fine art furniture? It’s really trying to move the ball down the field and enlighten people with what is possible. 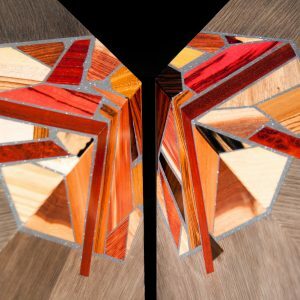 For me, creating pieces where you turn the phone off and you don’t have any appointments and you’re working with the object and the wood itself, whether it’s applying wood to a substrate in some of my mosaic pieces or cutting a dovetail, it’s very rewarding for us, doing the actual benchwork and the creation. From that perspective, I’m kind of doing what I started way back in the late 1970s and early 1980s. I’m trying to create again. I could have done it earlier, but I don’t think I would have been able to do it as well. The journey I’ve gone through is kind of helping guide me to get to this point. What are you working on right now? What was your inspiration? We just finished a center table called Convergence. I wanted to do a center table because it’s a form that’s been popular for many years, and I wanted to create a table that was a piece of sculpture. If you only looked at the base — and say it was done with I-beams — it could be in the Smithsonian sculpture garden. We designed the coffee table and the end tables to work as a group and express unity between them while utilizing carving details to create individualism between them. It’s made from local naturally downed walnut book-matched boards, Richlite black diamond made from 100 percent recycled Food Standards Agency-grade paper, imitation gold leaf, oil sizing, and traditional natural resin oil varnish. The use of old stock and that from naturally downed trees is very important in our production as well as to utilize the naturally occurring figure and grain characteristics of the wood, including what would have been considered the non-usable portion of the tree, such as the sapwood and areas of defects in the layout and production. We’re very conscientious about our footprint. Somewhat like George Nakashima would indicate: The wood speaks to you and tells you what to do. In this case, we’re inspired by the wood that’s easily accessible to us in a sustainable way. When did you first read The Soul of a Tree, and how has it influenced your work? 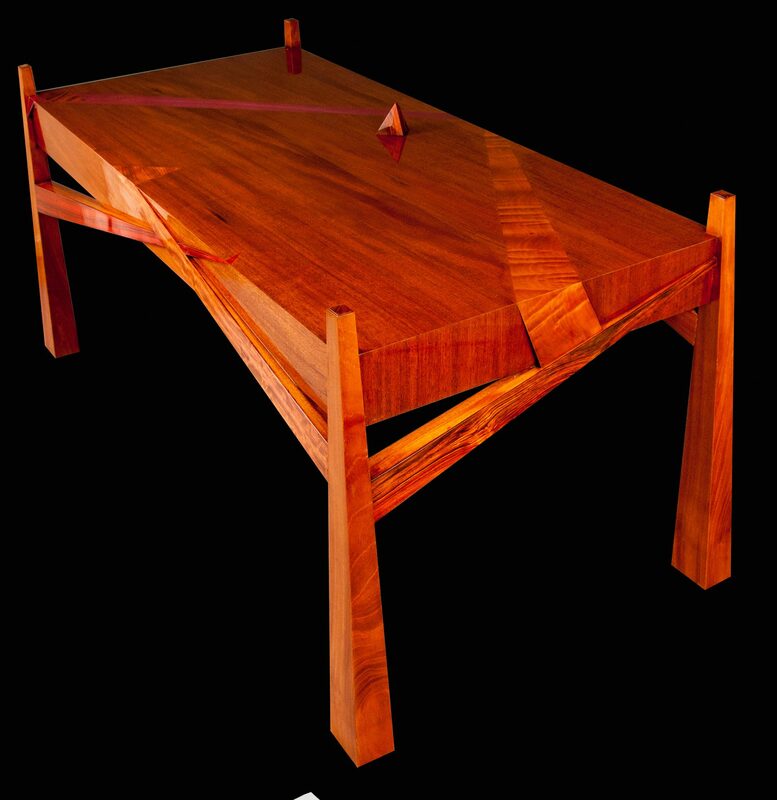 I was first introduced to George Nakashima when I was in college. It always resonated with me that he truly looked at the wood and what the wood was offering and then decided what to do with it. Typically, you buy the wood you need to cut it up to the shape you want to put together. That’s not the way he thought. That was a revelation to me back in those days. What does “putting the art in furniture” mean to you? Within the furniture realm, the art nouveau and art deco time frame was the last really big push where you saw so many things that were different. The hardware was different. The forms were different. I think that we just want to be able to create as unusual a piece yet as functional a piece as possible. That’s our motivation. Where I’m going with it on the art side is it’s going to be an abstraction of some form or another. Art movements that influence me are going to be abstract impressionism, cubism, plasticism. All of them lend themselves to furniture because of the angular nature, because of the various elements within the composition, because of the colors. 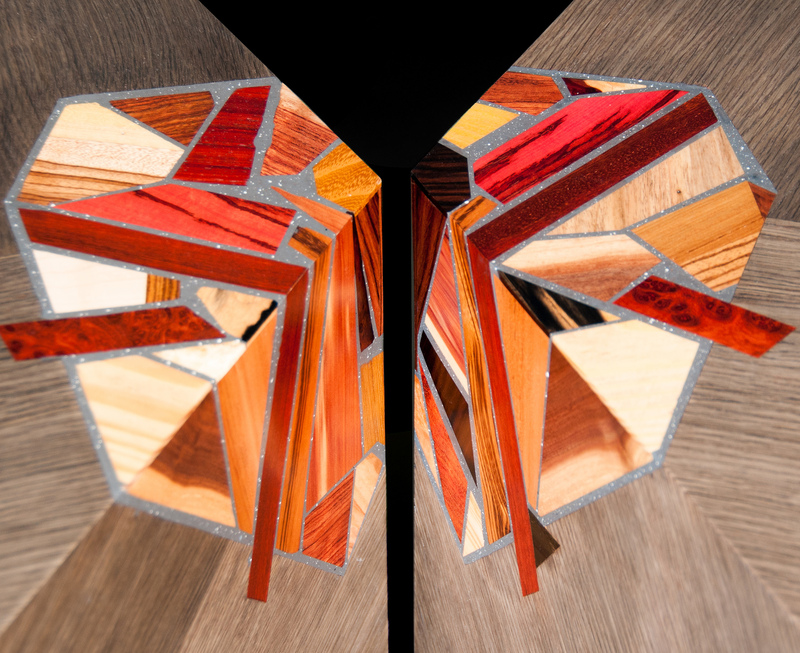 You could carve something like some of our organic abstract impressionist pieces. You could work with mosaic and apply small angular pieces on a surface. We’re decorating the surfaces of our furniture as if it were a painting. That’s how I envision our work. Sculpturally, you can’t get too crazy because the furniture has to function. A table has to be a table. Yet you can make aspects of it very sculptural or artistic. That’s where we want to go with it. Really, the sky’s the limit. 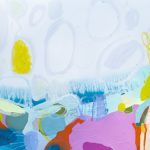 Schuettinger and MosArt will be exhibiting at Spectrum Miami Dec. 6–10, 2017. For more information, visit mosartfurniture.com.